The Social Innovation Entrepreneurship and Enterprise Alliance (SIEEA) has developed a Manifesto as a means of collectively advocating for itself and developing its own narrative in order to continue to grow. Meredith Turnbull from the Alliance explains. The Social Innovation Entrepreneurship and Enterprise Alliance (SIEEA) is a strategic partnership of intermediary organisations working to support the growth and improve the impact of the ‘social economy’ in Australia. We describe the social economy as people and organisations working to strengthen national wellbeing and community wealth, by recognising the interdependence of social, cultural, economic and environmental performance. It includes collaborations, networks, individuals and organisations of diverse sizes (including social enterprises, social businesses, co-operatives, mutuals and Not for Profit organisations) operating with an explicit social purpose. The SIEE Alliance’s vision is of a dynamic, productive and sustainable social economy as an integral part of an inclusive and growing economy and society. As intermediaries, our member organisations have supported thousands of individual social entrepreneurs and social enterprises, as well influenced their operating environment through sector development work. Through these endeavours we have recognised that the Australian social enterprise sector is now at a point where it should be collectively advocating for itself and developing its own narrative in order to continue to grow on its own terms. 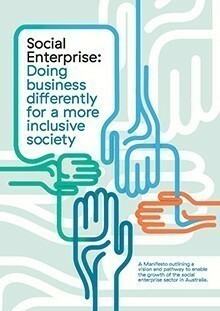 This is why we developed the Manifesto, Social Enterprise: Doing business differently for a more inclusive society. We want to begin a conversation with social enterprise as well as the broader public, private and social sectors, about what it would take to have a thriving social enterprise sector in Australia. We are calling for a thriving social economy where all social enterprises in Australia can access market opportunities and support services to grow to their full capacity, achieve scale appropriate to their business and fulfil their mission. The Manifesto identifies five key levers that we believe will significantly reduce the barriers to entry and enable stronger growth for the Australian sector. Foster an enterprising culture to raise the profile of social enterprise and the opportunity it presents. Raising awareness and understanding of the diversity of business models and how they are positively impacting upon our social and economic challenges, is critical to opening markets and growing the sector. Resource effective capacity building support for social enterprises so that the diversity of models and approaches can be effectively supported and developed. The size and complexity of the social enterprise market means that enabling organisations need to develop the scale, depth or reach to effectively respond to the sector’s needs. Develop procurement channels and open markets to capitalise on recent trends in purchasing decisions. From individual consumers to private and public sector procurers, a strong desire has emerged to balance economic value with broader social impact and public value. Enable funding, finance and investment across the business cycle. Social enterprises require a diverse range of finance and investment mechanisms depending upon size, risk profile and stage of business growth. There are considerable gaps in the finance and investment landscape, especially in regard to funding for innovation, transition and early stage enterprises. Invest in research, benchmarking and impact measurement to inform more effective public policy, design appropriate solutions and ensure the right areas of the sector are being targeted. Collaborative research that is industry–led, with strong partnerships across leading Australian universities and establishing benchmark data will provide an evidence base to support our sector development in the longer term. The Social Enterprise Manifesto is the beginning of the conversation. We are launching the Manifesto with events around the country in February and March. Our individual members will continue to support the development of the social enterprise sector while collectively the Alliance will be developing plans to work on each of the levers. A large part of this work will be examining the feasibility and most effective mechanisms for developing a social enterprise-driven representative body to represent the collective needs and voice of the Australian sector. Our hope is that the Manifesto, and our ongoing work harnesses both the energy that comes from our sector’s diversity and the strength that comes from unity to create a thriving social enterprise sector that benefits all Australians. Social Traders, School for Social Entrepreneurs, Social Ventures Australia, Social Firms Australia, Jobs Australia, The Australian Centre for Social Innovation, Employee Share Ownership Australia, Social Business AUstralia, Social Enterprises Sydney, bankmecu, Foresters Community Finance, Social Enterprise Finance Australia, Desert Peoples Centre, Pollinators and Queensland Social Enterprise Council.